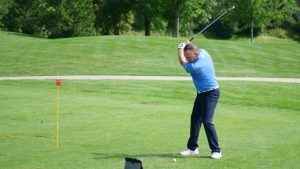 What if all golfers could critically observe their own swing the way instructors can? That’s the question the creators of LiveView Golf have both asked and answered with the LiveView Golf camera and app. This device has helped countless golfers amp up their practice productivity by enabling them to watch (and correct) their own swing motion in real time. Now, LiveView is introducing the next generation: LiveView+Plus. With advanced technology and brand new features, LiveView+Plus is sure to revolutionize the way golfers of all levels practice the game. The concept behind LiveView is simple. Users can set the LiveView camera at any height and angle for the perfect view of their swing. The camera syncs wirelessly to a tablet or smartphone that displays the swing motion as it happens through the LiveView app. LiveView even uses state-of-the-art Digital Swing Mirror technology, creating a mirror image that makes it easier and more natural for users to adjust their swing as they notice errors. 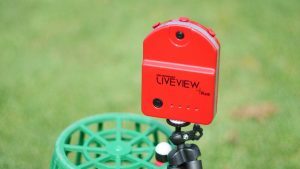 One of the most game-changing aspects of LiveView, however, is the Automatic Swing Detect function, allowing LiveView to automatically record two seconds before and two seconds after ball impact. Now, LiveView+Plus has enhanced this feature further by tapping into LiveView’s number one goal: immediate feedback for faster results. With LiveView+Plus, users have the option to “auto replay” the previous swing. They can even set this function for one automatic replay or for a continuous loop. This way, the golfer is able to see their swing immediately after they’ve made it, while they can still remember how it felt. And with LiveView+Plus’s adjustable video speed option, users can even set the replay for slow motion, allowing them to catch every detail of the swing. Imagine this slow-motion replay combined with LiveView’s Swing Tools function, which enables users to draw coaching objects on the screen. The potential for effective self-guidance has never been higher. – 60 frames per second for high-quality slow-motion replay—that’s an improvement of three times more frames than the LiveView Golf Classic. -A wireless connection using 802.11 BGN to capture more swing data. -A minimum imaging distance of nine feet with an optional wide-angle lens adapter to reduce the minimum imaging distance below seven feet. -Video delays under 0.5 seconds, so the golfer sees the truest possible representation of their immediate swing movement. All these advancements come in the same lightweight package. Just like LVG Classic, LiveView+Plus is fully portable, completely wireless, and its rechargeable battery holds power for two hours. This device truly is the golf studio that fits in your pocket. With LiveView+Plus, golfers develop kinesthetic awareness at an accelerated pace, with no interruption to the flow of their practice. From the casual golfer to the touring professional, LiveView+Plus is an inevitable game-changer. If you’re interested in introducing LiveView Golf to your audience or clients, now is the time to get in contact. For sales or purchase inquiries, contact LiveView Golf at (408) 213-2030. For more information on how to take part in the promotion of Live View Golf or marketing inquiries, contact Tyler Prins at [email protected] or by phone at 605-351-4378.